BOISE -- It's an issue that has plagued the state for decades, dividing Idahoans and searching for a solution. Environmentalists, federal agencies and power companies are still trying to find common ground on how to protect salmon but to still provide the things people need - like power and irrigation. "The current system is perpetually broken and perpetually expensive," said Zack Waterman, director of the Idaho Sierra Club. Now, because of a May 2016 ruling by U.S.. District Judge Michael Simon, agencies like the Bureau of Reclamation and the Bonneville Power Administration are starting from square one and holding public meetings under the National Environmental Policy Act. "He said if salmon are to have any chance of surviving their encounter with modern man we must implement new ways of thinking," said Waterman. "He directed them to consider major hydro operation changes including bypassing or breaching the four lower Snake River dams." Conservation groups and federal agencies are focused on dams on the Snake River that are used across the Pacific Northwest for several reasons, like flood risk management, hydropower, irrigation and navigation. "No we really do need these dams," said Terry Flores, executive director of Northwest River Partners. "They're a cog in the whole regional power system, they provide over 1,000 megawatts of clean reliable hydro energy." Conservation groups like the Idaho Sierra Club believe removing the four dams - that environmentalists blame for the decline of Idaho salmon - is the best solution. 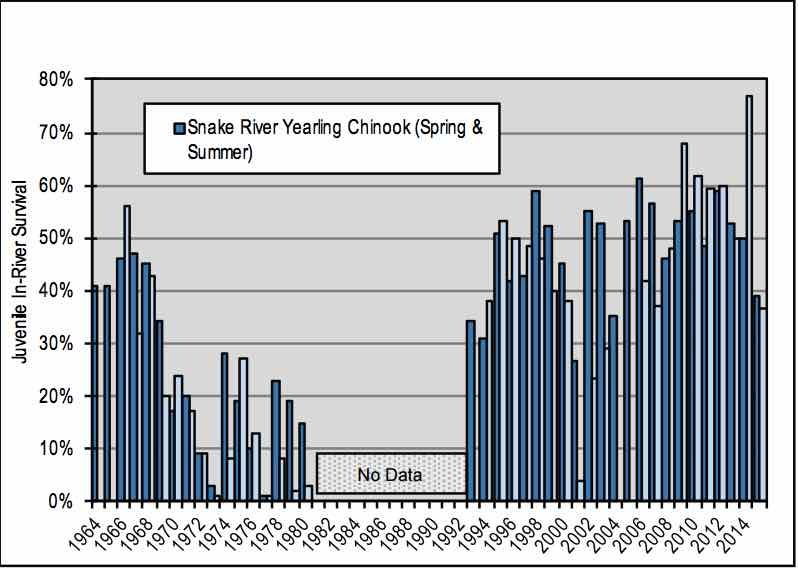 "Between 1965 and 1975 we built dams in the lower Snake River and that's when we saw these numbers kind of crash," said Greg Stahl with Idaho Rivers United. They've also come up with other ways to generate power. "There are creative things we can do with how we balance and manage the grid," said Waterman. "There have been several studies that have shown that we can cost effectively replace this power." Waterman says they've thought of replacing the power output from these dams with wind or solar power. "You often hear, well couldn't we just replace those dams with wind and solar?" said Flores. "The unequivocal answer to that is no. It's an easy answer but it's not a correct answer." Flores says the dams aren't to blame, especially in the last decade with new technology that has improved fish passage through the dams, like fish ladders and fish slides. "Now downstream survival of young fish heading to the ocean has been vastly improved," said Flores. "So you get about 97 percent survival through the dams on average." Instead, Flores says everyone should look to answer other questions. "Are we managing our hatcheries correctly?" said Flores. "Could there be improvements? How should we approach harvest? Are we harvesting too much, or are we about right?" Conservation groups and environmentalists believe they are on the brink of the greatest opportunity to restore salmon habitat. "It's a really critical component as our ecosystems are dealing with changing climate," said Waterman. "We need to do things differently with this river system to protect salmon." Federal agencies will hold four more public open houses which will be held in Oregon. If you can't make it there will be webinars available. Agencies Discuss Salmon Protection, Snake River Dams <-- Watch at original site.